What is the Pope’s Idea of Reform? Throughout the course of the pontificate of Benedict XVI the Pope has commented on several occasions of incidents of reform and renewal that have occurred within the universal Church; most notably and succinctly, during his Weekly Wednesday General Audiences. In numerous cases, the Holy Father has tied the cause of reform and renewal to certain trends that occurred within the Church in the contexts of monastic and religious life, thus making religious orders a vehicle in some sense for enacting and implementing new and vibrant forms of living out the Catholic faith. Yet, as always, Benedict XVI has a very unique idea of what constitutes this renewal and how it is carried out. So, in his opinion, the Cluniac example of reform and renewal was not only successful on account of its own unique spiritual and theological integrity; it was special, in the fact that it was directly subject to the Bishop of Rome, thus insuring that “purity” and “fidelity” prevailed throughout the movement. “There is another aspect of St John Leonardi’s spirituality that I would like to emphasize. On various occasions he reasserted that the living encounter with Christ takes place in his Church, holy but frail, rooted in history and in its sometimes obscure unfolding, where wheat and weeds grow side by side (cf. Mt 13: 30), yet always the sacrament of salvation. Since he was clearly aware that the Church is God’s field (cf. Mt 13: 24), St John was not shocked at her human weaknesses. To combat the weeds he chose to be good wheat: that is, he decided to love Christ in the Church and to help make her, more and more, a transparent sign of Christ. He saw the Church very realistically, her human frailty, but he also saw her as being “God’s field”, the instrument of God for humanity’s salvation. And this was not all. Out of love for Christ he worked tirelessly to purify the Church, to make her more beautiful and holy. He realized that every reform should be made within the Church and never against the Church In this, St John Leonardi was truly extraordinary and his example is ever timely. Every reform, of course, concerns her structures, but in the first place must have an effect in believers’ hearts. Only Saints, men and women who let themselves be guided by the divine Spirit, ready to make radical and courageous decisions in the light of the Gospel, renew the Church and make a crucial contribution to building a better world.” Once again, it seems clear that Pope Benedict’s concept of reform is conditional. As long as one does not publicly or fundamentally disagree with the Pope, as the Protestant Reformers did, then their actions can be considered renewing and positively reforming the universal Church. In the Holy Father’s most recent General Audiences of 2010 he has once again reflected on the cause of “reform and renewal” citing the Franciscan and Dominican Orders as important and visible agents in this initiative. But when we sit back and example these specific Orders, what is the common denominator that unites these monastic communities to the others that the Pope has described in his previous reflections? Ultimately, either by of their own choosing or of a sense of implied necessity, St. Dominic and St. Francis’ concepts of religious life were critiqued and given approval by the Pope. To Benedict, this is the difference between John Leonardi, Francis, and Dominic and their Protestant counterparts–Luther, Calvin, and John Wesley. Recognizing the Pope’s authority as a given is always a necessity when carrying out any sort of reform that is beneficial to the life of the universal Church. Conveniently, the Holy Father chooses to omit numerous instances of individuals throughout the Church’s history who were part of monastic communities who openly opposed the Pope on several different occasions. St. Bernard of Clairvaux, one of the great medieval Doctors of the Church, wrote to then Pope Eugenius III–in his De Consideratione— and admonished him; explaining to him that the papacy could only be an instrument of service to the Church, uniting all of its members in charity, rather than lording power and certain prerogatives over some in an authoritarian manner; as had become the rule du jour in the Middle Ages. St. Catherine of Sienna, another Doctor of the Church, is most notably known for her extremely vocal and public critiques of then Pope Gregory XI–one of the Bishops of Rome who lived in exile in Avignon, France during the Great Western Schism of the fourteenth century in which two different popes were recognized, one in Avignon and one in Rome–which ultimately convinced him to return and resume his rightful position in the ancient See of Peter. St. Catherine also urged Pope Gregory in her letters to reform the clergy–which was notoriously corrupt– and also the way that the Papal States were administered. One final example is not necessarily connected with monastic life per se, but nonetheless, is still of significant relevance. In the Acts of the Apostles a glimpse into the life of the early first century Church is provided when a dispute is described that ultimately causes a synod (traditionally characterized as the universal Church’s first “Council”) to be convened in Jerusalem to reach consensus and clarification on the issue. The matter at hand was the question of Gentile converts to Christianity and whether they would have to first be circumcised–thereby becoming Jews–in order to be considered followers of Christ. In these early days of Christianity, the apostles and disciples of Jesus still had not clearly distinguished themselves as an entity or movement separate from Judaism. They simply saw themselves as proclaiming Jesus as the long-awaited Messiah that the Jewish people had yearned so long for. Still Peter, John, Paul and most of Jesus’ followers remained observant Jews and saw nothing contradictory in proclaiming Jesus as Lord and Messiah while continuing to worship in the Temple of Jerusalem as well as keeping the laws of Moses. Does this then suggest that even the Pope can be persuaded to have a change of heart on certain issues–even ones of an extremely substantive and personal nature that have to deal with the very core of who we are as human beings–and see things in a new light when enlightened by his brothers? Of course, Pope Benedict XVI would most likely, probably not see things this way. But the fact remains that throughout the Church’s history numerous saints have spoken out against certain practices and tenets sanctioned by the Pope and other prelates within the Church. It seems that comprehensive reforms only moved forward after points of contention were made to the Bishop of Rome and the necessity of a new way of approaching things was embraced. Thus, loyal dissent–especially in certain monastic contexts–has been a long-held reality of the Church. 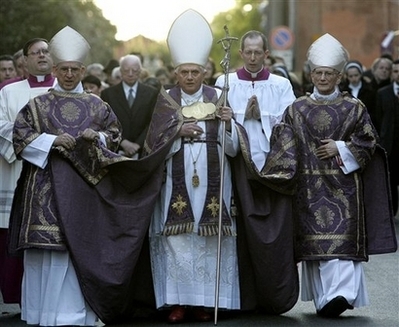 But of course, Benedict XVI does not and probably never will see things this way. The ongoing investigation of women religious communities here in the United States proves this. The Vatican sees this women a threat because they think for themselves and have interpreted certain matters in a new, enlightened, forward thinking manner. Instead of seeing this as the Spirit possibly moving in the midst of their communities; the Pope, Cardinal Rode, and other leaders of the Church see this as a potential threat, because these women religious have dared to speak out, in some cases, against some of the Pope’s proclamations and have advocated alternative ways of interpreting the Gospel in light of today’s times. Unfortunately, this Pope is not listening as Pope Gregory did to St. Catherine of Siena. Pope Benedict would rather listen to those who tell him what he wants to hear, like zealous adherents of Opus Dei. If anything fits Benedict’s criteria for true “reform and renewal” it would be these group within the Church. The fact that it is an autonomous entity, a “personal prelature” ,directly under the jurisdiction of the Pope should be the telling point. Reform to Benedict is only real unless unwavering fidelity to the Roman Magisterium in all circumstances, particularly the Pope, is met. So, under an oppresive climate such as this how will true and genuine reform endure? The answer might be surprising. “…In a Catholicism shaped by the politics of identity, many religious orders will rediscover precisely those elements that mark them as distinct–wearing habits, for example; engaging in more sustained periods of both individual and common prayer; and less immersion in secular pursuits. This option for a more high-tension style of religious life could in theory produce a revival in religious orders, at least in term of head counts. So it seems once again that genuine reform and renewal within the Church will once again stem from within the monastic setting. Instead of being interpreted as a global phenomenon, perhaps this is the “creative minority” that Pope Benedict alludes to as the future of Christianity? Phillip, this is an excellent piece. It’s very well-written and makes its point very persuasively. Here’s something that strikes me as I read it: it’s interesting that Benedict’s defining the charism of religious communities like the Franciscans and Dominicans without reference to what those communities say about their own charism and origins. This Vatican-centric way of defining religious life robs religious life of its most significant contributions to the church. Religious communities don’t develop from the center, because Rome tells them to develop. They grow out of the response of a charismatic individual or individuals to cultural shifts that generate a new way of living the gospel in a new cultural setting. It would be interesting to hear groups like the Franciscans and Dominicans define their own charisms, rather than hearing a definition of those charisms imposed by Rome. I suspect that if the Vatican permitted that to happen, it could learn much about what it means to be a follower of Jesus in various cultures today. And that’s really the point I think that American religious women are making when they return to Rome their constitutions in lieu of the questionnaire that the Vatican has sent them in the recent investigation of the LCWR. The only thing the papacy wants to believe in is consolidation of its own authority. Thank you for this wonderful article. I’d like to respond from personal experience. Long ago I taught young children. Now schools like docile, well-behaved children. But is docility the best quality for adulthood? Aren’t flexibility, creativity, and good social skills, along with assertiveness and the ability to set limits necessary qualities to those who become productive, contributing members of adult society? I often worried about the kids who were docile and inhibited. Whereas I frequently reassured the parents of rambunctious children that perhaps their child might have difficulty navigating the waters of classrooms where they were expected to sit and be quiet, but that I fully expected them to turn out to be wonderful adults! The pope wants docile children, not adults, as “good catholics”. But the world needs adults! The world needs healing. And good healers, in my view, are people who can make decisions for themselves, taking into account a multitude of factors and juggling many moral claims in an effort to search out the right decisions – in an ongoing effort to maintain personal integrity as well as balancing the welfare of those around them, whether those others are younger or weaker and thus in need of guidance and protection OR if they are adult moral agents, in need of reverence as independent, contributing members of society/community with their own charisms, perspectives, and input into shared decision-making. It was necessary for Cluny at the time of its founding to appeal especially to Rome and to assert its independence from other powers. The problem with previous monastic developments during this time was that they were frequently dominated by local nobles. Cluny’s submission and appeal to Rome was a means of establishing independence from meddling nobles. This is repeated throughout history. The papacy has been a force for the independence of ecclessial entities insofar as Rome intervenes to secure their independence from secular powers. In the East, the Eastern emperor and the czars essentially controlled the Church. The papacy’s struggles against the Holy Roman Emperor and the kings of Europe helped to secure a measure of independence for the Church. As for the women religious, if this new, forward looking spirit, is all its cracked up to be, then why are they dying out? The orders experiencing growth tend to be more “old school” if you will. Old is the new new. Get with the times man. Latin is hip again.